The following is a joint statement issued April 3 by ETFO, AEFO, CUPE, OECTA and OSSTF. 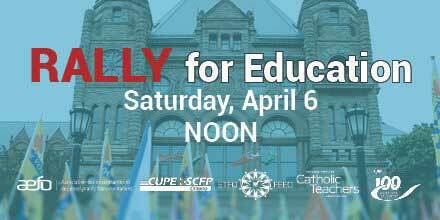 As the largest representatives of educators and education workers in Ontario, the five signatories are: the Association des enseignantes et des enseignants franco-ontariens (AEFO), the Canadian Union of Public Employees – Ontario (CUPE), the Elementary Teachers’ Federation of Ontario (ETFO), the Ontario English Catholic Teachers’ Association (OECTA), and the Ontario Secondary School Teachers’ Federation (OSSTF). The joint statement was a combined effort to express unity across the education sector that puts the needs of students first. The full statement is available online here: https://shar.es/amI3mb.